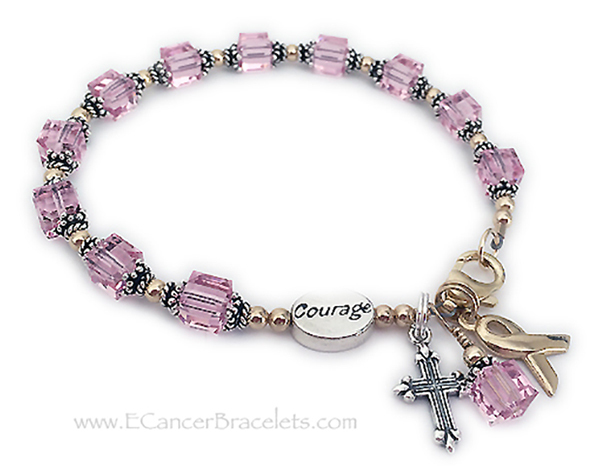 This Breast Cancer Courage Bracelet has 6mm square Swarovski crystals (18 color options) shown with pink for breast cancer (you choose the cancer/color during the ordering process, as well as the toggle style). It has 4mm 14k gold filled beads between the .925 sterling silver 5-star bead caps. This Breast Cancer Courage bracelet also comes with a COURAGE bead and 2 charms; a 14 gold plated ribbon charm and a Swarovski crystal dangle. This design is also available in only sterling silver! 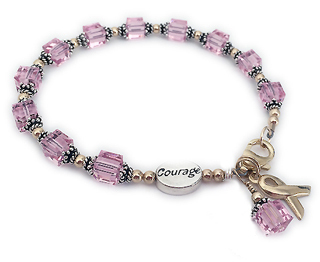 (above) PINK or OCTOBER - This bracelet comes with 2 charms; ribbon and dangle and COURAGE bead. The Fancy Cross charm is optional. You may add as many additional charms as you would like. You also choose the cancer color.